Strakeljahn was the only commissioner who replied by email. 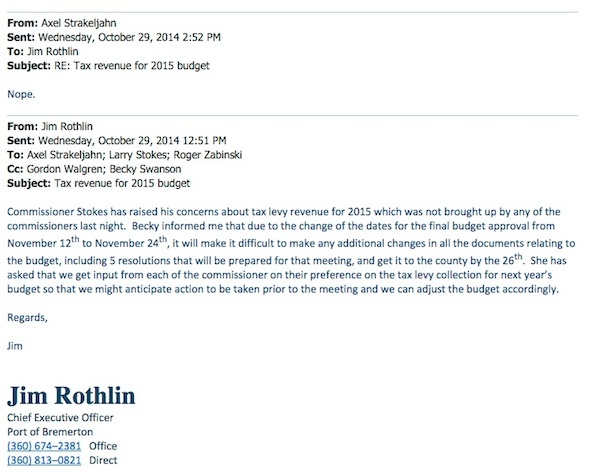 Stokes had called Rothlin earlier in the day (prompting the email above). Zabinski called Rothlin after receiving the email. Next up is a Nov. 5 letter sent by Nancy Krier, Assistant Attorney General for Open Government, to the commissioners and others. Based on that explanation, it’s possible to see why Zabinski construed the communication between Rothlin and the commissioners as a serial meeting, even if that wasn’t their intent. A quorum did weigh in on a piece of port business, though they only communicated with Rothlin and didn’t have direct contact with each other. Another point of open meetings law wasn’t mentioned in Krier’s letter but was brought up in my followup conversation with her. It involves “polling,” which can also be a violation of the Act. This occurs when members of a board are informally polled on a topic in advance of a formal decision, know that a majority of their body is being polled, and are aware of how others are voting. (There’s an explanation from MRSC of Washington here, under item 31). In his email, Rothlin said it was the staff’s intent to get each commissioner’s opinion on the tax levy amount in advance of a formal decision at the Nov. 24 meeting. He also mentioned Stokes “has raised his concerns about tax levy revenue for 2015,” which effectively let the other commissioners know which way Stokes leaning. In the port’s case, the staff prepared budget alternatives for the Nov. 24 meeting after learning two of the commissioners wouldn’t support a levy increase. The commission formally removed the levy increase from the final budget through a series of resolutions during that public meeting. In the end, the issue probably wouldn’t have made waves had it not been for the public blowup between commissioners. Still, it can’t hurt for elected officials and staff to continually review how they communicate outside of public meetings, particularly in light of the Bainbridge City Council’s recent misadventure. As Krier mentioned in her letter, a representative from the state Auditor’s Office plans to visit the port commission in January to answer questions about the Open Public Meetings Act.